This sleek, two bedroom suite is perfect for a couple, family or friends looking for an immaculate Hawaiian hale at an incredible value. The open floor plan provides plenty of space, with two executive bedrooms, fully-tiled bath, a spacious living room, gourmet kitchen and a stately lanai. Stunning views accentuate each room, while brand new furniture and hardwood accents create a modern, harmonious feel. This property has an amazing view of Kalapaki Beach. Also being able to use the Marriott's faxilities was a huge plus. Conveniently located behind the Marriott on an overall quiet street. Balcony affords amazing sunset viewing and ability to watch the comings/goings of the harbor. It can get noisy with waves on the breakwater, folks having fun on the water, or events at the Marriott, but overall we weren't too bothered by it. Lots of options for walks in the morning or evening. Well appointed kitchen which is quite serviceable. Property is well managed, with only a few burned out bulbs and stubborn screen doors to complain about. 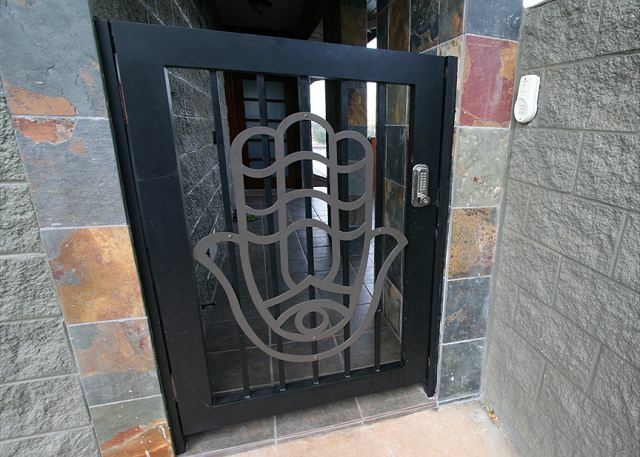 This place was AMAZING- clean, kitchen was stocked with condiments, silverware, cookware. The view was to die for! I cried when I left!! The location is great and we loved being able to use the pool and beach at the Marriott resort. Another plus was having free parking just outside our door. To be honest, the apartment is not as nice as it appears in the photos. The living room area is tiny and the furniture is old. It also appears that several of the photos were taken of the apartment next door, including the one with the hot tub on the balcony. Also this posting says one bed, one bath but the apt we stayed in actually had 2 bedrooms and 1.5 baths. I am not sure if they are using this posting for both units. The concierge service was nice to have and everyone I communicated with was extremely friendly and responsive. Overall we had a great time enjoyed the location and the views. Would recommend to a friend. I was pleasantly surprised with the size of the place, and the views were beautiful! Having easy access to the Marriot added to the experience as well. Could never get Rental Host to work after initial reservation. Was provided an email that gave me the necessary info. Placed several calls on the week end to the 800 number and never received a call back. Light for main bedroom in fan did not work. Aloha and thank you for your feedback. We have a team standing by 24/7 at our 877GOKAUAI number so possibly the number that was being called was incorrect. We're sorry for frustration this may have caused. Regarding the mention of the bedroom fan light not working. It was checked by our maintenance team and is working properly. We appreciate your feedback and thank you for being our guest! The view from the condo was even more amazing than we expected. We loved the decks and had breakfast there every morning. Convenient to have the grill easily accessible. The only negative we had was the dishes were not clean when we arrived, though they had been in the dishwasher or put in the cupboards, several of them were dirty. My wife and I stayed here for 7 nights for our honeymoon. We were a bit disappointed as the pictures when we researched the property the Kauai exclusive website very clearly show a hot tub on the balcony of the bedroom. When we arrived it has either been removed or the photo was from the neighboring unit. We were otherwise 100% pleased with every aspect and would absolutely recommend the unit to anyone, just need to update the pictures online to prevent confusion. Beautiful view and convenient location for a good price, can't beat it. We had a wonderful vacation at the Cliff House. We were surprised and delighted by how close it actually was to the Marriot Resort (the elevator from the cliff to the beach made getting to and from so easy) and we were thrilled with the amenities there. The kitchen was equipped with everything we needed to make gourmet meals (even spices and oils!) and the bed was giant and comfortable, so nice to enjoy our morning coffee in bed and watch the surf at the same time. The only thing that I would say could use improvement was the main living room where the furniture was ill designed and uncomfortable (also pretty tired) so we didn't get much use out of it and it would have been nice to spend a little more time enjoying some lounge space there. A little design thought and some new furniture is all that needs to make this a usable and luxurious space tho! We had a car and thoroughly enjoyed exploring the island, would definitely recommend it and look forward to an opportunity to stay again! Good property, great location. Perfect for a couple (with space for +1-2 more) seeking a private place to stay with all the conveniences of home. Location is on the cliffs and steps from golf course...with the added bonus of being a short walk from the vacation pleaures of the Marriott. Watch the sunrise & sunset from the porch & enjoy sleeping with the sounds of waves crashing. Highly Recommend this property. Fabulous home away from home ! We enjoyed the waves, the amenities and the view! The rental was clean, neat, and spacious. Incredible views! The resort access was really easy and only a quick walk away. We had a few small issues (water on refrigerator not working right, and what we thought was a mouse, but ended up being a gecko). These issues were resolved promptly and professionally. The bathroom is wonderful, with 2 shower heads, and although it's European style (no shower curtain), the space and the cleanliness makes up for that. Overall, we really enjoyed our stay here for 5 days of our honeymmon! Great condo with beautiful view! Very easy to get to the Marriott beach and pool. Very quiet and peaceful neighborhood. Its 2 stories so be aware there are stairs. Also the second bedroom was helpful to lay out our clothes and items we brought, but there aren't any dressers to put clothes away, but there are closets. The kitchen is fully stocked and very has nice appliances. Nice condo. Not much seating area, could use some basic maintenance and new furniture. We were just two people. The layout would not be very conducive to more even though it has a second bedroom. Very nice place to stay, just make sure you have a phone! view. The Roosters were up early! We stayed at the Cliff House for a week over New Years. It is a really unique location with great water views. The unit was very clean and most everything you'd need/want provided. Bonus is you get to see the sunrise from the back windows or just steps out your door. We couldn't have asked for more during our Kauai vacation- although we decided on our Christmas trip only 2 weeks in advance we were lucky to still get this gem. The team of Kauai Exclusive was very responsive and helpful to make sure we get this opportunity along with another great accommodation (Waipouli Beach resort) for our last night. 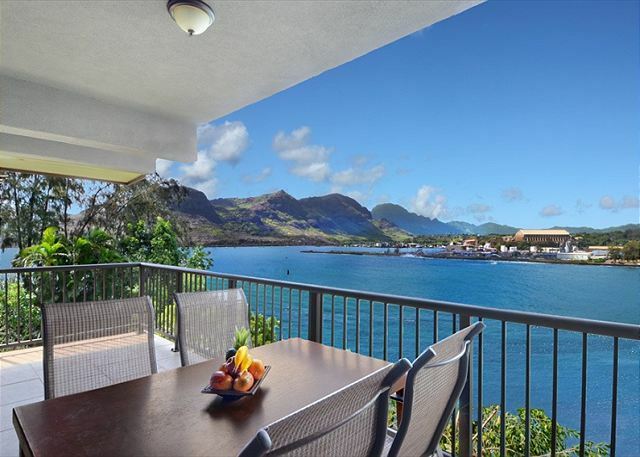 The condo is even nicer than on the already good pictures and is divided on two levels- both with large balconies opening onto Kalapaki beach and bay. Great way to start your day with breakfast outside looking at surfers and paddleboarders. Kitchen is fully equipped and very modern and I loved the design and woodflooring in the bedroom upstairs. Parking is super easy and really just across from the condo- so please don't get spooked of any previous reviews mentioning you can't park in front of unit (if you are not able to transport your luggage for about 30 steps no idea how you make it to the airport;). Also,although Christmas is for sure high season, the unit was very quiet, the neighbor dogs very friendly and not barking at all. No problem that the unit doesn't have AC- with the ceiling fans and being able to keep all doors open through the night it makes for a nice breeze and it is a bonus to fall asleep to the sound of waves. Marriott access is for sure convenient and even better for us was being right next to an amazing ocean golf course that comes with great visitor rates when you are staying in the Cliff house. The only improvement idea from our side would be lounge chairs on the balcony- since the living room and sofa is not really set up to lounge this would have been amazing for relaxing on the balcony. Overall, this was the best vacation rental we ever had and we would come back anytime- also the price was really good and you couldn't get anything comparable in a hotel! Thanks again Kauai exclusive team for helping us find this great place. We could not have asked for anything more during our stay here at the Cliff House Suite. Location was perfect and access to the Marriott Beach Club was a big plus. We were provided with plenty of towels, toiletries and utensils and pots and pans to cook. 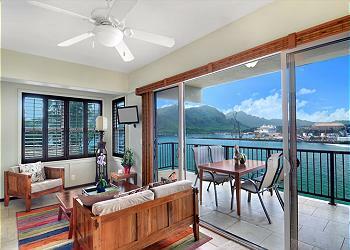 We enjoyed meals on the lanai with an amazing view of Kalapaki Beach. Kauai Exclusive was awesome throughout the whole booking experience. 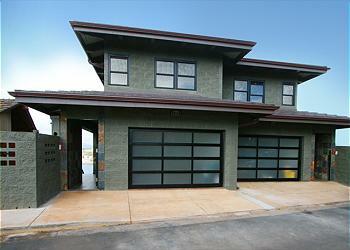 Would recommend them as well as the Cliff House Suite to all my friends and family visiting Kauai. I look forward to going back in the near future and will be booking our stay at the Cliff House Suite!! The unit has a beautiful kitchen and bathroom, and a comfortable bed. The deck has a nice view of sunsets and we spotted a sea turtle down below in the waves. It's an easy walk to the Marriott, with its beautiful beach and pool area and good restaurant. The Marriott is quite lovely and it was nice to have access to its grounds and amenities. You can also access the rocky shoreline or wander around the Marriott grounds; lots of good paths available as well as several restaurants and a bit of shopping within walking distance. It is a very quiet and peaceful spot, and we appreciated that. Negatives? I phoned at the beginning of our stay to request a couple of light bulbs be replaced; this request was not addressed. The unit looks like it could use a little bit of upkeep. The location was a bit cool; it faced west so the sunshine came at the end of the afternoon only and there was pretty much always a breeze blowing. As well, while we were there, Kauai was experiencing some unseasonably cool temperatures, and we had to scrounge around to find a couple of extra blankets. Lastly: perhaps the services are just not available but I find it shocking that I was not able to recycle paper, plastics, tin...only glass apparently. A compost option would have been nice as well. Overall, we enjoyed our stay and it worked well for us. I recommend it if you are looking for a quiet getaway that is centrally located with good walking access to a bit of shopping, several restaurants, and the amenities of the Marriott. Great place to stay beautiful view, nice kitchen, nice bedroom and the walk to the Marriott is worth the stay. We really enjoyed the stay at the Cliff House Suite, it had great views, convenient location, and the folks at Kauai Exclusive made everything easy. When we needed some flexibility in our check-out time, they really went to bat for us. We couldn't have been more pleased with the whole experience! We rented the Kauai Cliff House Suite for our honeymoon and we really enjoyed it. It was a short walk down to the beach and the Mariott pools. We also enjoyed happy hour at Duke's, Kalapaki Joe's and Mariachi's which were close by. The feral pig was another great place to go for drinks and pub food within walking distance. The layout of the unit was not what we pictured. On the main floor was the entrance, kitchen, living area and half bath. The second floor had 2 bedrooms. The master had a large bathroom in the bedroom and the other bedroom had the washer/dryer in a closet. This was a good layout for a couple or a small family. Whoever stays in the second bedroom still needs to access the master bathroom to shower so this might be challenging for two couples. We didn't realize it had 2 bedrooms and we didn't use the second bedroom at all. We thought it came with a garage as we saw the garage in the pictures but that wasn't part of the rental. There was ample parking across the street. It was more space than we needed but we enjoyed staying there and would recommend this unit to a small family. The contacts that we had at the rental company were wonderful and made the booking easy and answered our questions when we called. Beautiful home, nice finishings, amazing view, nice quiet location at night but walking distance to the Marriott if wanted. It was tranquil, welcoming, and one of the best experiences! Will definitely be back to the Cliff House! This condo was perfect for us - we loved the space it provided and the spacious balcony with fabulous views. We were a 5 minute walk from the resort facilities of the Marriot and the beach. There is also an ABC convenience store within walking distance which was great for stocking up on breakfast provisions, snacks and wine. We were upgraded to the upstairs two bedroom condo as the weather was unusually hot/humid and the upper level condo had a bit more air flow (there isn't any air conditioning). It was still a bit hot but certainly bearable as there are a number of ceiling fans and portable fans. Overall, a great experience and terrific value. One of the most pleasurable stays we have experienced in our years of travel. Found the location perfect for access to restaurants, the beach and as a launching point for our daily adventures. The home was spotless, well appointed down to the smallest detail and the furniture very comfortable. A delightful breeze off the ocean kept the temperature pleasant and the sound of the waves was delightful. Should we every re-visit Kauai we would stay there again. Kudos as well to Josh and Sonja for all their help. I would highly recommend this property, everything we needed was there and the location is first rate. Pleasant staff to deal with too. Access to the Marriott's facilities make this is a no brainer. Truly an experience of a lifetime. Beautiful surroundings, perfect weather everyday, amenities of a 5 star resort, staff always helpful and friendly, the last true Garden of Eden on this planet. My new home away from home. We stayed here at the Cliff House overlooking Kalapaki Bay. 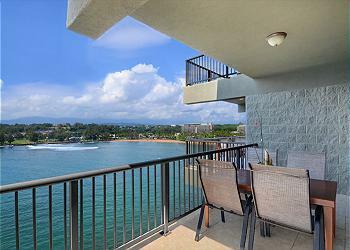 The ocean right at your door, and gorgeous views of the surrounding mountains and golf course. My favorite room actually is the front bedroom overlooking beautiful peaceful greenery with ocean breezes. 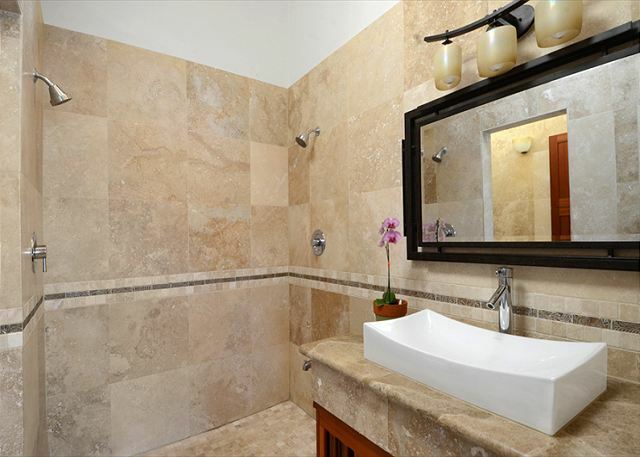 Both rooms boast vaulted ceilings adorned with dark hardwoods and the bath is all new with stone floor to ceiling. It is a beautiful home! We were able to truly relax in these wonderful surroundings. We recommend it! both the cliff house and the management company were wonderful! From Josh staying on the phone with me to personally make sure I made the right turns to get there to letting us have a late check out since our flight left so late, this was a great experience! The view is spectacular. The unit has everything a person could ever need while on vacation, down to aloe for a sunburn which I appreciated. Thanks for such a wonderful vacation!